This is the the home page for the 98th ARS Vets Association. The 98th ARS was stationed at Lincoln Air Force Base from the mid 50s to the mid 60s. The Vets Association was formed in the early 80s. This web site will try to chronicle the Association beginning with it's reunion in Lincoln Nebraska, in the Spring of 1984. If you would like copies of any of the pictures on these web pages, right click on the picture and then follow the drop down menu. 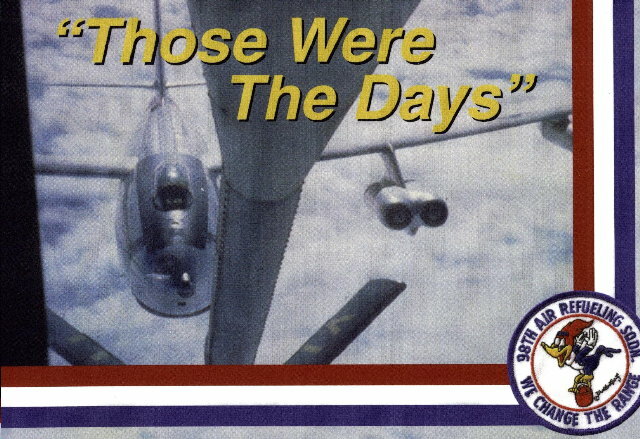 More about the 98th ARS can be found at Rob Branting's "History of LAFB" website CLICK HERE then click the "Back" button to return to this site. The 307th-Bomb Wing also has a website. To link to it CLICK HERE then click the "Back" button to return to this site. The 98th Bomb Group also has a website. To link to it CLICK HERE then click the "Back" button to return to this site. The 40th-Bomb Wing also has a website. There are some great KC-97 pictures on it. To link to it CLICK HERE then click the "Back" button to return to this site. This website is sponsored by Betty Murray in Memory of her husband Chuck. Chuck was the association's first President and served as it's Historian for several years. We will update this web page periodically -- stay tuned.